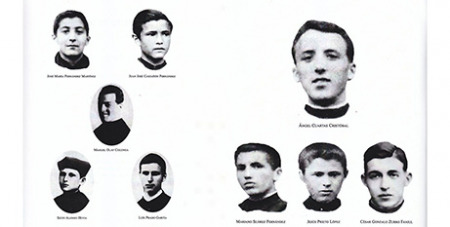 A 22-year-old who was shot 11 times in the street and a 21-year-old stabbed to death after being imprisoned in his local church are among a group of nine seminarians beatified as martyrs from Spain's civil war persecution. Source: Crux. “They wanted to be priests, but God chose the altar of highest sacrifice for them in a Mass that does not end,” Archbishop Jesus Sanz Montes of Oviedo said in a pastoral letter. The archbishop published the letter to mark the March 9 beatification of Angel Cuartas Cristobal and four fellow seminarians, who were dragged from their seminary and shot before an angry crowd on October 7, 1934, when republican forces overran Spain’s northern Asturias region. Another seminarian, Mariano Suarez Fernandez, was shot at Oviedo the previous June, while the remaining three were killed during the subsequent 1936-39 civil war. Cardinal Angelo Becciu, prefect of the Vatican Congregation for Saints’ Causes, celebrated the beatification Mass at Oviedo cathedral. Around 8,000 Catholic clergy and religious order members and tens of thousands of lay Catholics were killed during the 1930s conflict, after an anti-clerical Popular Front government sanctioned a campaign to desecrate and destroy churches, convents and monasteries.